Every year we are asked, “Why do you celebrate Chanukah?” and/or “Are you Jewish?” I understand people’s curiosity. I even understand that they may think it’s a little weird. Heck, I even think it’s a little weird that I’m not Jewish and I celebrate Chanukah. But like I tell my kids, sometimes weird is good. It means you’re not following the norm. And more often than not these days, it’s the norm that’s becoming weird. Since the question keeps coming up, I thought I would write a little ditti about why we celebrate Chanukah. CNN aired a show called CNN Heroes: An All Star Tribute. I enjoy shows about everyday people who are heroes. More acknowledgment needs to be given to people who go out of their way to make a positive difference in this world. Chanukah is a time for acknowledging heroes. It’s a time for me to remind my children that the biggest heroes and the people worth looking up to are those who fight for just causes. Chanukah is a story about a group of underdogs fighting for a just cause: the honor of God and religious freedom. It is a story about people fed up with oppression and finally doing something about it. Think American Revolution. Chanukah is a story of triumph over evil, of light driving away darkness. Every time I reread the history of Chanukah, I’m astounded at how oppressed the Jews were. I think many people fail to realize how much freedom had been taken from the Jews. The Greeks weren’t satisfied to just rule over the Jews, they wanted to change the Jew’s very essence. They wanted the Jews to think like them and to live like them. Yet, many Jews resisted becoming like “the nations” hence the Greeks got a bit ticked off and brutally oppressed them where it hurt the most; at the heart of their spiritual beliefs. Women who insisted that their sons be circumcised were killed along with their babies. Brides were forced to sleep with Greek officers before they could be with their husbands. Jews were required to sacrifice pigs to the Greek gods. Studying the Bible and Sabbath observance became a capital crime. And a statue of Zeus was erected in the Temple. Finally, someone decided to fight back. One family, led by the father and then by one of his sons, stood between the mighty Greek army and the conquest of the spiritual essence of the Jews. The family was the Hasmoneans, and the son was Judah Maccabee. Led by Judah Maccabee, which means hammer, the Jews fought for their religious freedom. The military victory by a ban of Jews against the most powerful army of the day was quite a feat to say the least. In fact there is a statue of Judah Maccabee at West Point to commemorate the outstanding military victory. After years of fighting, the climax came when the Jews finally took back the Temple and rededicated it to God. Relighting the golden menorah symbolized spiritual light being rekindled throughout the land, and the miracle of the oil was the exclamation point of God’s hand working through a small group to defeat a nation that was hell-bent on destroying His people and their spiritual heritage. Think 1967, 1973, today. 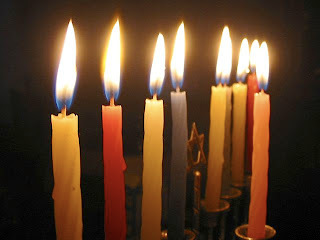 Chanukah represents much of what I want my children to value and to stand for: The honor of God and religious freedom. I want them to know deep inside that even if they are the minority, they still are obligated to stand up for truth. I want them to know without a doubt that the God Whom they believe in still performs miracles. I want them to know that it is “not by might, not by power, but by My Spirit says the Lord.” I want them to know that in this world, sometimes they will have to get a little “crazy” to combat the craziness around them just as the Maccabees were "crazy" to fight against such odds. That’s why on night one of Chanukah my daughter and I danced and sang a song at the top of our voices. It was U2’s “I’ll Go Crazy if I Don’t Go Crazy Tonight.” No, really, it was the perfect song. It says, “It’s not a hill it’s a mountain as you start out the climb. Do you believe me, or are you doubting? We’re gonna make it all the way to the light. But I know I’ll go crazy if I don’t go crazy tonight / Every generation gets a chance to change the world. Pity the nation that won't listen to your boys and girls. Because the sweetest melody is the one we haven't heard. Oh, but a change of heart comes slow / It's not a hill it's a mountain as we start out the climb. Listen for me, I'll be shouting. Shouting to the darkness, squeeze out sparks of light.” That’s what Chanukah is, a shout out to darkness that the Light is coming. I also told my children the story of a modern-day Maccabee, a modern-day hero. It went something like this: There’s a man in Israel who believes that Jews should have the right to pray on the Temple Mount. He believes that it is fundamentally wrong that when the police see the lips of a Jew moving while they are on the Temple Mount, that they promptly make them stop praying. This man fights for the right for Jews to pray on the Temple Mount and he asked people around the world to join him in that fight. People were encouraged to make their voices heard by writing or calling the Israeli government to let them know that Jews should be able to pray on the Temple Mount. One night while this man and his wife were home, they heard a knock on their door. He answered the door to find members of the Shin Bet, the Israeli Security Agency, at his home. They asked if they could talk to him. They proceeded to tell him that he had two choices. He could either stop trying to fight for the right to pray on the Temple Mount or he could go to jail. My daughter stopped me at this point and said, “Wait. You mean the Arab police. It couldn’t have been the Israeli police.” I sadly told her that she had heard me right the first time. She couldn’t comprehend why the Israeli police would want to stop Jews from praying. She is very wise. I ended the story by telling my children that they know this person. Their eyes got wide at the thought of knowing a real-life hero. When I told them his name (he’s given me permission to publically tell the story without using his name because he is still watched by, not only the Shin Bet, but the CIA), their mouths dropped open and they cried out in concern wondering if he had been put in jail. Thankfully, I was able to tell them he was not in jail. And, also thankfully, he continues to fight. So no, we are not Jewish. But yes, we celebrate Chanukah. In a crazy world where the U.N. announces it’s more historically accurate to consider Rachel’s tomb an Arab mosque, where the U.S. government tells Jews not to build houses on their own land, where the Vatican announces that the Jews are no longer God’s chosen people, I combat the craziness by lighting eight candles. The candles are a symbol of my pledge of allegiance to the people of Israel and to the God of Israel. And it is a prayer that I will always have the courage to stand on their side. Chanukah is a hands-on history lesson that I pray my children won’t forget. God forbid that they ever have to face religious persecution. But as ancient battles seem to be resurfacing, I admit I wonder sometimes. And God forbid that they are ever in desperate need of a miracle. But if they are, I pray that they will remember they serve a God of miracles. May they always know that if they serve the God of Light, they will never have to stay afraid of the dark.